I have no reason to dislike kale, but it’s one of those vegetables that I don’t usually buy. It probably has everything to do with location. At the grocery store down the street where do most of my shopping, the kale-in-a-bag sits perkily next to collard greens in-a-bag which sits next to the fresh cut fruit in-a-bowl. And that’s the section that I avoid. Fruit is not that hard to cut and I just can’t get myself to pay an extra $2.00 a pound for someone to cut fruit into big chunks, package them in a cheap plastic container and then suffocated with plastic wrap. I’m a hypocrite because I happily buy green beans in a bag, asparagus on a styrofoam tray, chicken in a vacuum bag and orange juice in a box. Just not fresh fruit. When I was in New York last week, my friend Grace asked me if I had ever tried crispy kale chips. At first I thought it was one of those fancy health food products, made with gourmet ingredients like tricalcium phospate, hydrogenated soybean oil and ascorbic acid. But no, Grace said, just kale, olive oil and salt. So, I had to try and now I’m hooked. The kale leaves bake to a shatteringly crisp, crackly snack. They really shouldn’t be called chips, they look nothing like them, but when I called them chips, the kids came running to try. Oh, and for the record, I’m totally okay with buying kale in-a-bag, I just give the fruit in-a-bowl the evil eye as I walk by. Start with a big bag of kale. And the most important step is to spin dry the leaves. Toss to coat. Here’s another secret – do not salt the kale just yet. Adding salt before it goes into the oven is just bad, soggy news. The salt will make the kale leaves leach out some water, which in turn will make them soggy in the oven. And that means soggy kale, not crispy kale. After tossing with olive oil, bake in the oven until the leaves are shatteringly crisp but still bright green. Timing depends on how much olive oil you use. Then season with salt. And then you call it “Kale Chips” see if your kids will eat it. 3. 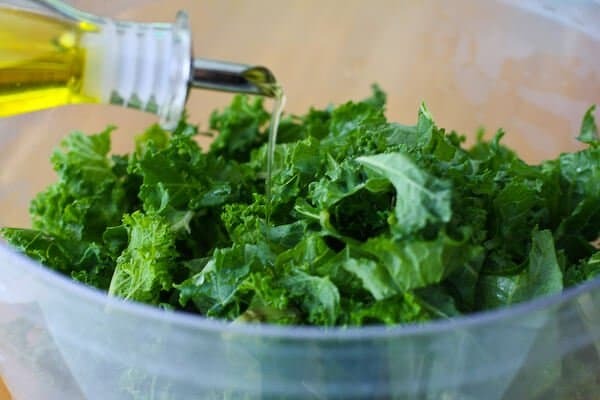 Drizzle olive oil over the kale leaves and use your hands to toss and coat the leaves. Bake in the oven for 12-20 minutes until leaves are crisp. Take a peek at the 12 minute mark - the timing all depends on how much olive oil you use. 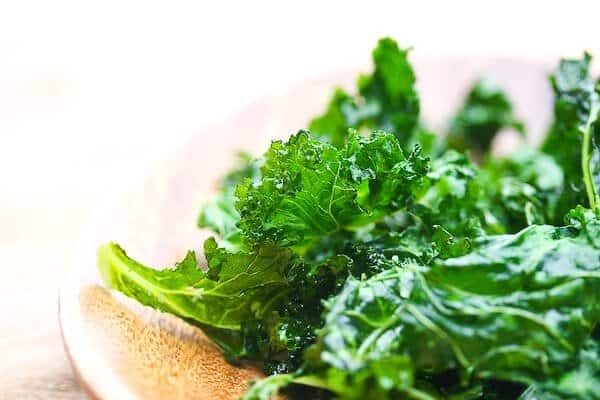 Just use a spatula or tongs to touch the leaves, if they are paper-thin crackly, the kale is done. If the leaves are still a bit soft, leave them in for another 2 minutes. Do not let the leaves turn brown (they'll be burnt and bitter) Remove from oven, sprinkle with salt and serve. Great suggestion to spin dry and add salt and pepper AFTER baking. Absolute home run and gives a great healthy alternative way to use kale. You spelled means wrong where you were saying salt make soggy kale you said mans. Love these! Just made 3 batches. First I mix all liquid and flavorings in big bowl and then add the leaves and mix all by hand, making sure to coat all leaves.1–olive oil, lime juice, cayenne pepper, ground cumin, and sea salt. 2–olive oil, lime juice, curry powder, sea salt. 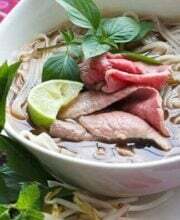 3–olive oil, lime juice, low sodium soy sauce. Just put some kale in the oven to make chips. I was looking for how long to leave them in when I found your site! (didn’t completely dry and salted before I put them in! Oops!) I tossed them with mojo de ajo instead of plain olive oil and sprinkled grated parmesan cheese on top. I hope they come out okay. I’m trying to eat healthier and I’m dying for crunchy potato chips right now! My one complaint is that the kale shatters all over the place when you bite into them. All over the floor, all over the counter, etc. Also some recipes say you can use them in place of potato chips for dip. I find this impossible, as they completely shatter if you try to dip them. 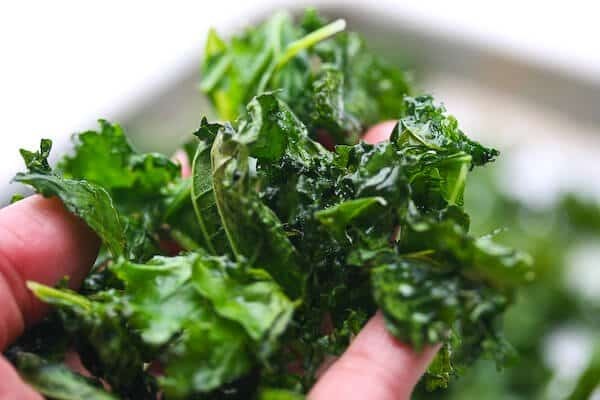 Break the kale leaves into smaller bite size pieces as a small potato chip before drying. Last summer we had a garden in the back of our inner-city church. The goodies were there for any and all to enjoy. Each Wed. we had neighborhood kids in for a gardening class. Every week we had them fix veggie treats from the garden. They always proclaimed they didn’t eat anything green, but somehow, when making things themselves, everything always disappeared and they wanted more. Baked kale was met with many faces and groans. Once out of the oven, they couldn’t eat it fast enough, and every week thereafter, they begged for another kale bake!! WOW! I am so excited to try this recipe! Thanks to much for the great tips! I have tried making them before, and salted ahead of time and they did not turn out to great! You Rock! thank you so much! i made this today for my mom and younger brother and they were all over it! such a great way to eat your leafy greens without the leafy green feeling 🙂 super easy too because i tend to mess up most recipes. i used fresh kale from farmers market instead of bagged kale, so yummy! Kale is easy to grow and will grow year round. Up to zone 8 will grow uncovered all winter. Grow in gardens, flower beds, or just pots for year round crop. Have so much kale now am looking for new recipes. Have dehydrated kale successfully. We use a lot in salads finely chopped. I can’t believe how good these chips were. I just traded up from my potato chip addiction to these. On my way out to the store now to buy more kale. Thanks for tip about drying the kale very well before baking. Hi, this looks fun. I bought some kale especially. I’m just wondering, how long do the chips stay fresh and crisp for can you make them a day in advance for example? I tried a kale chip recipe and it was very bitter. The bag looks just like the bag in this photo. Is there a way to pick milder ones? None of my four kids would eat more than one…frankly, I didn’t want to either. I was hoping for a veggie alternative to chips but I’m not sure if I did something wrong. Any suggestions? Thanks. Bitter kale = old kale….unfortunately, I think you just had bad luck on the package. i heard about the kale chips, but didn’t hear how to make them. i had just bought coconut oil for the first time and was going crazy with it, so i fried the kale in the coconut oil. fantastic! just have to be careful to not over cook. We have been a vegan family for about 48 hours. Just made these kale chips and my 6 year-old was fighting my 4 year-old for them. They were gone in 2 minutes. They like these more than popcorn and so do I! Great recipe! This recipe was amazing!! When I started looking for kale recipes, I didn’t really think my kids would like anything that involved the veggie! They couldn’t get enough of this one!!!! And my youngest is a picky eater!! I ended up making two batches because everyone ate the first in about 15 mins! lol LOVE THIS RECIPE!! You realize hydrogenated oils are trans fats???? This sentence is ridiculous. 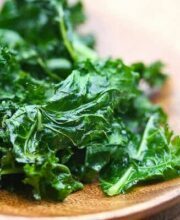 This is definitely the best recipe I’ve found for kale chips..nice and simple and the tip for the salt made all the difference! My first batch just went in about 2 minutes 🙂 Thanks! Kale chips have become my family’s latest addiction. They hardly ever make it off the cookie sheet, we just eat them right then and there. I just made this, super yummy. It didn’t turn out bright green, but maybe I baked them a smidge too long. I had them in the oven for ten minutes at 180 degrees Celsius, but next time I’ll try five and go from there. Thanks for the recipe! I should have really read through your post before baking them to dark green. It’s still good, but yours look better. Thank you for the recipe! Love these! I only need to bake mine 8 minutes or so though–hotter oven maybe? So I would definitely recommend checking on them a few times in the process! I baked this today. It was delicious unsalted. One of our house guests said it was the best kale chips she’d ever tried, and she’s had supermarket kale chips! But when my saltaholic dad tried adding salt, it didn’t stay on the chip. It just fell right off. Mom also tried adding different spices, but had the same problem. Did anyone else have this problem? Am I not adding enough oil? Try salting immediately right after you take them out of then oven. Once they cool a bit, spices and seasonings won’t stick on as well. Made these today along the lines of your recipe. Worked out great! Used shichimi togarashi (Japanese spice mix) and salt to season them – fantastic results! Thanks. I baked this today and loved it! Thanks for sharing the recipe. If you dont want to print 18 pages, just think a little bit first. Copy and paste the text only to MS Word. If you want a picture on the recipe, pick one and do the same thing. You can edit the size of the picture and everything. Very simple, no-brainer. Be careful if you try to print this recipe—It prints 18 pages for one little recipe. A little annoyed right now that this recipe sucked up half of my printer ink! It better be delicious! My boyfriend and I love kale. Mostly in stews and soups but crispy baked kale is delcious as well. I make a homemade chicken and dumplings with kale all the time. Even though it does smell funny while baking, this was the best treat on my low carb diet. Thanks for the tip on the salt! Pingback: Healthy, Hungry, and Happy » Pork Chops with Apple Chutney, Roasted Sweet Potato’s, and Kale Chips! Another great vegetable recipe! Everyone in my family participated in making this tasty and, yes, insanely addictive dish which reminded us of nori and more specifically, Korean nori. Although this dish is a favorite and we’ll make it again, we all agreed that this dish was time consuming because we didn’t want to crowd the kale while cooking for fear that it wouldn’t be crispy. It took 7 minutes to cook the kale in a convection oven and we also tried different kinds of salt. My son especially liked the kale with garlic salt and one with cajun seasoning. Thanks for a unique way to introduce us to kale. this looks amazing. I’m going to try this recipe tonight! Thanks for the tips on the salt too! I fell in love with this at a local restaurant. Thank you for the recipe tutorial. I can only find kale in the regular produce section… Not in a bag… So it takes a little more effort, but still looks so simple! I’m trying this tonight! Maybe I can actually get my husband to eat something good for him! 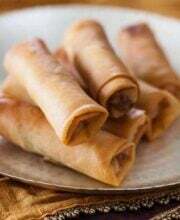 my daughter and i made some and the whole familly loved them.it was like the family couldn’t eat them fast enough we had to made a lot of them and they never get sick of them. Thank you so much for this recipe!! I finally made my crispy kale the way it should be! 325 degrees in the convection oven was the key. Even my dog enjoyed the crispy crunch of the kale. Got kale at the farmer’s market this weekend and made a batch today. I couldn’t stop eating it; it’s like potato chips! LOVE this recipe! I have made these 2 or 3 times! Saw the idea in a Jacques Pepin book. 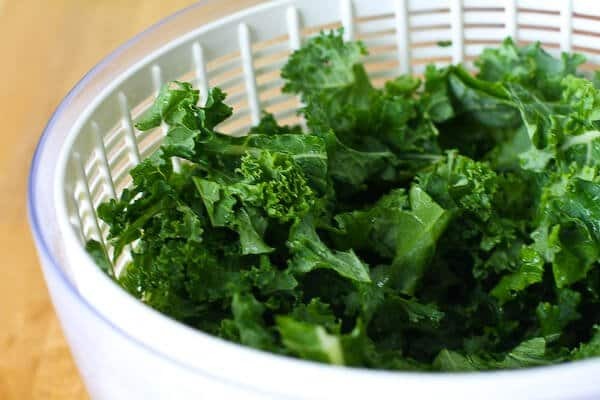 Served them at a party the other night and no one could believe how good they were–and that they were kale! I salt them with the olive oil though and have not noticed them getting soggy. He said in France they served crispy parsley so I may try that next! My kids go bonkers for this! It’s good with a little lemon juice as well. I found that salting before doesn’t make it wilty as long as you cook it long enough. I prefer the salt before so it’s not too grainy! Roasting veggies like broccoli and cauliflower is the best! I can’t wait to try this!! Do you think this would work just as well with mustard greens? I haven’t tired with mustard greens! let me know how they turn out! thank you for the perfect instructions. the kale chips were to die for! We made this the past week as a side dish with some Flowering Red Kale and it turned out not so good. Don’t think we will be making it again. It’s just not something we have the taste for, and I really wanted to like it. Oh well. sorry for the other comment on the wrong post. The kale chips are definitely yummy! I love kale and cannellini bean soup but this is so different. And as someone mentioned to sprinkle over the soup or salads or pasta can enhance with flavor and texture! Will be fixing these again and again for friends and just for me! If you make the entire bag, can you store the uneaten “chips?” How should one store them? Or is it best to make only what you plan to eat? I accidentally did a burnt version last week when I did a roasted chicken and kale recipe. I thought I had ruined it. There was far too much black in that roasting pan, but ohmygoodness it was the best part of the meal… and it wasn’t even done right! I can’t wait to try it this way. I have never seen kale in a bag like this. At my grocery stores, it comes in a bundle next to the other bundled greens. I have been making kale chips for almost a year, and I absolutely love them. I don’t spin dry and I do add kosher salt before cooking (not much), but I haven’t had a problem with soggy kale yet. Sometimes, I dice up garlic to go with the kale. I have kale in the fridge now and, thanks to your post, I know what I’m making for lunch! I introduced my vegetable-averse four-year-old to baked kale last fall. She was in the middle of an obsession with Jenny Greenteeth, so I called them “Jenny Greenteeth Chips”–and she ate them all up! Jackpot! Love. Trick is not to overcrowd them so they get crispy all over. Thnx. Lickin my chops. I’ve tried these before and they never came out right. But this time… holy YUM!! I made this hoping that my children would like it. After pulling it from the oven and salting it, I fully expected them to turn their noses up at it. But my daughter has now consumed a couple of bowls. Thanks for the great recipe! OmiGosh!!!! Just made them…for 2…and they are GONE!!!! DEE-LICIOUS!! *I have no other salt in my home. Fabulous snack with drinks! In addition to dry leaves, spreading the kale on the baking sheet is key to get warm air moving around them. And those leaves were dry! I don’t have a salad spinner so I put them in an old pillowcase, tied the end, and swung it around (Iwas outside). My husband got some amusement before cocktail hour. OMG you are so right, this is so addictive! Funny, we must shop at the same store. The only fruit I get at that section is pineapple in the big cylinder chunk (I still will buy a whole pineapple) but for $3.00 on sale I’ll buy it that way to avoid the hassle. Anyway I had to get some greens for New Years Day and I saw the same bags, I choose the kale because of this post in the back of my mind. Well if Jaden uses it…. It was so good prepared like this, we had it tonight and you know I’ll get it again!! Made this, love this, addicted to this. I cannot find kale here in Italy, so I tried it with chickory. Delicious! recipe that I made tonight. Delicious. Thank you. Made this at home alone when you first posted it and ate it all…. then while at my dad’s for Christmas, we bought a bag and made another batch – even my non-Kale loving relatives raved…… GREAT STUFF! Okay, you’re the first to convince me to try kale. Sounds like a nice side dish to some Artisan Beef, too! made this last night for the first time – it was fabulous! you are right though, you do need to watch it – i accidentally burned my second batch! I saw these on The Kitchn and I am just now getting around to making it. My kale is waiting for me in the fridge – yours looks beautiful! I haven’t tried this yet but am anxious to. Wonder if the kale has the same nutrional qualities after cooking this way. I got your cookbook for Christmas (I asked for it after having seen and tried your broccoli beef recipe on Pioneer Woman’s website). I made your garlic butter noodles the day after Christmas and again today. My family thinks I’m some sort of goddess!! The most important thing is this: I have a daughter with cystic fibrosis who LOVES chinese takeout noodles. Since she needs calories however, wherever and whenever we can get them, we usually end up getting her takeout noodles at least 2-3 times a week. I have experimented with several combos of home-made noodles on my own..but none that she likes all that much. She literally ate her weight in your noodles..twice now. Who knew the magic combo was butter/shallots/garlic? Just that smell has her tugging on my sleeve asking when it will be ready. Thank you for this recipe. I predict it will be a standard go-to in our house for a long time! I finally made this tonight. You are so right: Insanely awesome! I adore potato chips and anything made with phyllo leaves because of the crunch but I’ve had to lay off those as I lose weight. These are the perfect substitute as long as I go light on the oil. Thanks. Just wonderful! This looks great! I’ll have to pick up some kale alongside the French bread I need to serve with your spinach dip tomorrow. I tried this last night with leftover kale that I had used for garnish. I had started them incorrectly as I was trying to remember a recipe that I had read somewhere else, but, I found this recipe and followed the ending steps and they still turned out good as a side item for my dinner that night. My husband ate the whole bowl and I did get to taste a few of the leaves. I salted mine with seasoning salt and it made them even better. I am going to fix them again tonight to take to a meeting. fantastic! glad you…er….your husb enjoyed! make that Kale — misspelling — sorry! I’ve seen this done a little differently… I have a brother in law that deep frys the cale. It all sounds great to me. Baking is a bit easier. I didn’t even know you could buy kale in bags 🙂 As a member of a CSA, kale is one of those tings you are always getting, so it’s nice to have new ideas for using it. Thanks for the post! Man O Man are these good! Yummy – Christmas Eve – cookin’ all day and what accompanies the first beer? 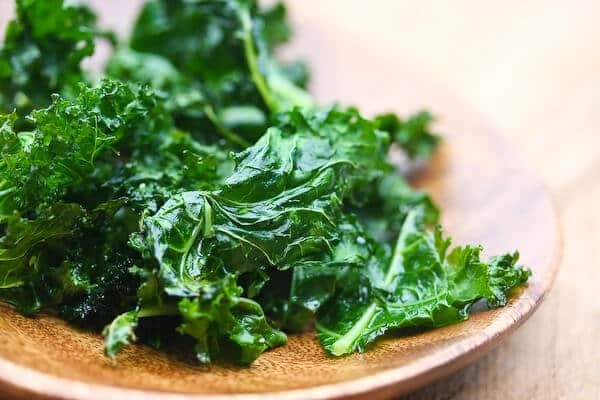 You betcha – crispy kale! Thank you Jaden. I’ve been meaning to try kale prepared this way but just haven’t done it, for some reason. Watching your kids munch on it, however, has swayed me mightily. I’m making this!! 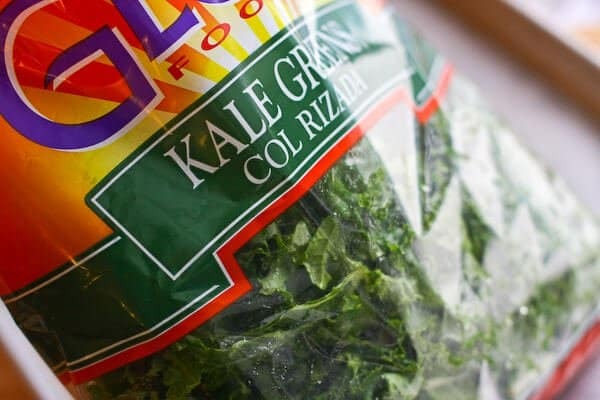 I am so doing this…wait, you have pre-washed, pre-cut kale in a bag? I’ve never seen that and I live in the (supposedly) foodie capital of the “Bay area”. I also like to sauté kale in a skillet with olive oil, add garlic after a few minutes, then salt and pepper. Once it starts to wilt, hit it with some balsamic. Tasty, but this sounds so much simpler and easier! Using olive oil spray works really well, too. Wow, this sounds amazing! I’ve never had kale before and this sounds like a great way to eat it. 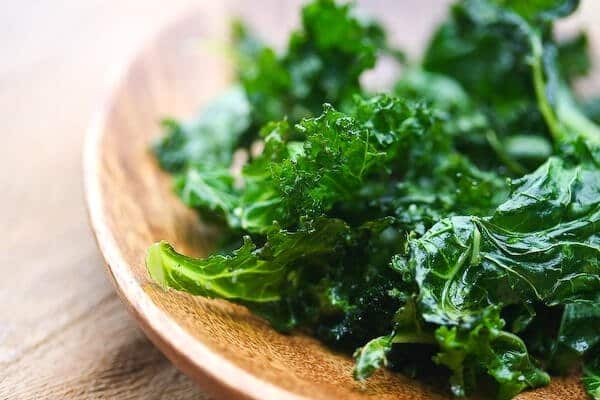 just tried the crispy kale and you are right it is insanely addictive – who would have thought that kale and addictive would ever be used together? I would never have thought to roast greens, this is great. I am with you on the cut up fruit, I think its not as juicy. And I always get the whole greens, why I am so happy to triple wash myself is beyond me. And they don’t cut the greens right, and it bothers me, haha, you think I’m a little type a? I can see this is going to be my new addiction, thanks. I keep seeing this everywhere and I have yet to try it. And then I forget about it when I’m at the store. Not anymore! Maybe I can sneak these on the table of snacks at NYE – whaddya think? Thanks for reminding me about this stuff! I made in once, loved it, and forgot to make it again! I haven’t been able to find any kale in the grocery stores this month (was looking for it for soup) but when it finally makes an appearance I’ll snap it up to make these chips. So much healthier than fried potato chips! Brilliant!! I will have to try this tomorrow! amazing! u rock my world! I LOVE Kale chips – they rock! You should try them sprinkled with a little freshly ground parmesan cheese and cracked pepper – another variation that is AMAZING! They totally take care of any “chip” craving I have! 🙂 Fantastic presentation as usual. Aahh , so simple, and yet healthy … have to try this one out. Any idea what other greens would bake crispy ? 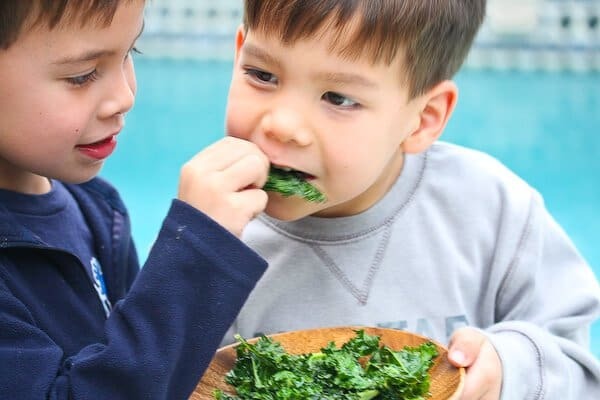 Love kale chips, I’m a big fan of recipes that make vegetables appealing to kids. I just served a kale casserole to several “kale haters” who were quickly converted! Such a simple and healthy snack! I like how most restaurants nowadays do the “Yin Yang” version of the kale, one side blanched, and another deep-fried (yup!) til utter-crispiness! I’d heard about “kale chips” before, but never encountered an actual recipe. Thanks! What a great idea to eat kale. I love kale anyway, although we tend to eat it as “boerenkool” (which is sort of mashed with potatoes and eaten with smoked sausage..) I’d love to try this once! I finally got your book!! And I love it!! I agree! They are insanely addictive. I just recently tried this and found myself craving for it and snacking on it late into the night! At least it’s reasonably healthy and much better than real chips! I tried this last summer when I had an abundance of Kale from my CSA share. It is great! It is the only way I have gotten my significant other to eat kale, and he is worse than most ten year old boys! wow gonna try that, greens are so good for you but not always so tasty but that sounds really good! This looks and sounds just wonderful! I am definitely going to give it a try. So glad to find your blog today, nice to meet you! Fantastic idea. My son loves nori, but it’s hard for me to get him to eat many other vegetables. I’m guessing this is enough like the seaweed (without the processing) that both he and I can be happy. Awesome! My mom does this with baby spinach leaves and eats them with hummus! Kale as a chippy snack? I’ve got to try this. It looks like it might be similar to that yummy sesame flavoured nori… Korean seaweed, I think. I haven’t seen kale in a bag. It’s usually decorative greenery in the deli section. I’ll have to search for it at Whole Foods I guess. Gotta try that salt later tip to see if it makes a difference to the crisp factor of the kale chips I cook. Thanks for that advice. As for buying in a bag: Never seen kale sold that way in my neck of the woods. Besides, half the fun of making this snack is stripping the kale leaves off the stems. Can hardly wait to try this…I don’t think we have kale in a bag here but will definitely look. Have done something similar with finely julienned “kai-lan” (Chinese broccoli) leaves that are deep-fried then sprinkled with sea-salt. This is a great recipe. I always look at the kale when I am at the store/Farmers’ market and pass by because I don’t really know how to cook it for my family…. I’m sure my kids will fight for them if I bake it your way. I’ll definitively make this soon. Thanks! I made these in the fall when the farmer’s market was full of kale. It was amazing, just like you said. And the kids loved it too. Glad you mentioned about salting afterwards. I had that soggy problem once, and now I know why. Jen from Tiny urban kitchen recently posted on kale chips as well. I agree with you with cut fruit and cut chicken. Questions: How long will this kale chips stay crispy? Can they be made ahead for at least a day? When I put this on the table, the kids actually fight over the vegetable! I adore kale! It has such a great flavour! These chips look fabulous =D. I love Kale, but rarely buy it because my grocery store never carries it. I never would have imagined cooking it this way… I guess I thought it would just wilt down and back into a dark green mess on the pan. Instead they retain their shape and structure and are a vessel for salt! Yum! yum! 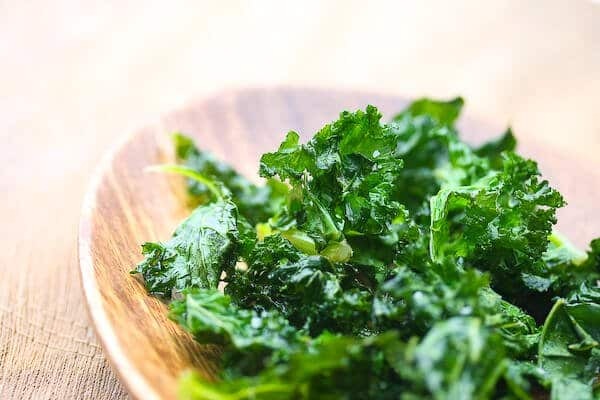 We call these Kale Chip – they’re so good! Now this looks like a healthier replacement to the Indian ‘bhajias’ that we make where spinach leaf is dipped in seasoned gram flour and deep fried. I have never tried Kale before and now I am curious to. Can spinach be done the same way, given its water content? And, the photos of the kale in a bowl are simply amazing! 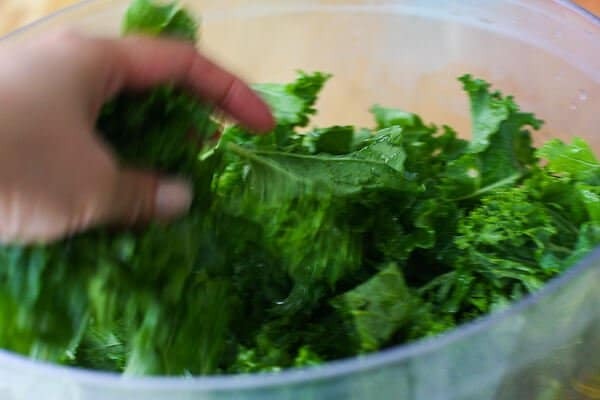 My absolute favorite way to make kale! GET OUT OF MY HEAD! Especially with the cajun spice. I could definitely get used to eating kale like this! I have some Tuscan kale sitting in my fridge – this is perfect for it! Although I must admit, it’s my first time cooking with the Tuscan kind, not really sure how it differs in taste from regular kale. I’ve never seen Kale in a bag before. I’ve made this before with fresh Kale from Whole Foods – they have a bunch of different varieties! Good tip on not salting until after they come out of the oven. I’ll have to try that!! I wonder if you can make the same thing with Swiss Chard or Mustard Greens? I’ve been wanting to try this forever. Good to hear you are giving it a thumbs up! Yum! 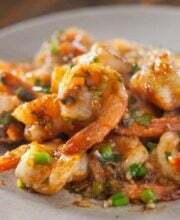 Our local Thai place deep fries them and serves them with more deep fried sweet and spicy shrimp. I am going to try your version. Sounds divine!